We have never been able for one reason or the other, mainly work, to harvest our olives. This year as we are now both retired we took the decision that we would. We were keen to convert some into oil and have some for eating. 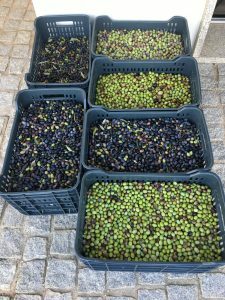 We have some friends who live not too far away, who had harvested their olives the past couple of years, so we spent a couple of days helping them to harvest theirs and to follow the process through with them to convert the olives into oil. We then could follow the same method to do ours. 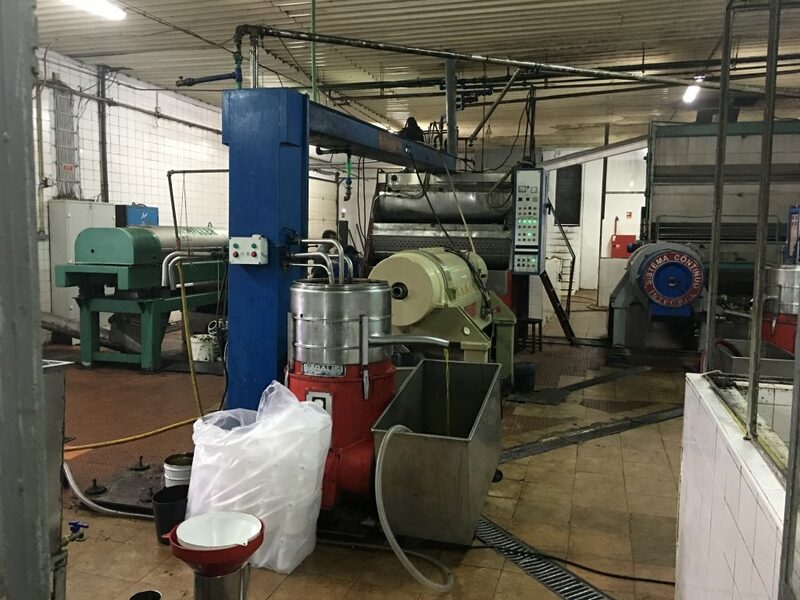 The first thing to do was get the necessary equipment, we already had ripadors that our friends have given us after helping them. 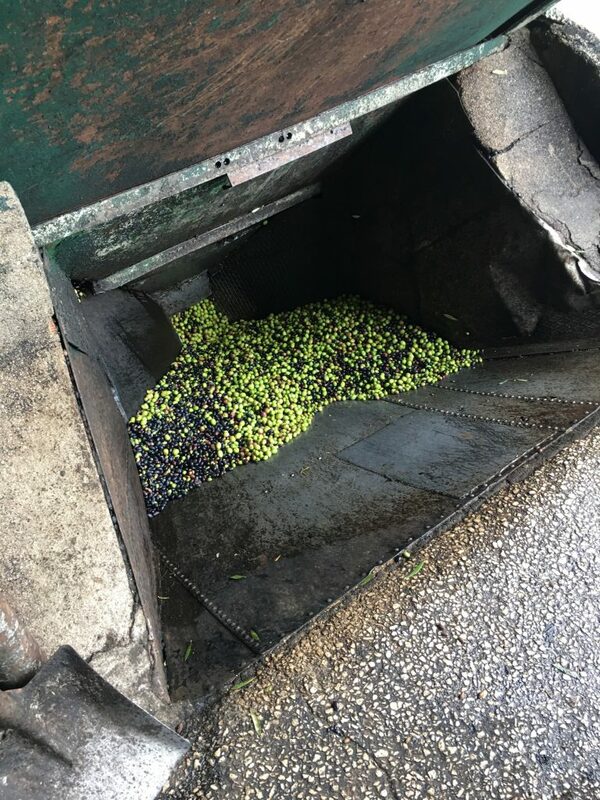 We just had to get a large net to lay on the ground under the tree to catch the olives as they fell, a few crates to carry the olives about, a couple of large buckets to do the sorting and some bags to be able to get them to the press (lagar). We then just needed a few days of good weather. 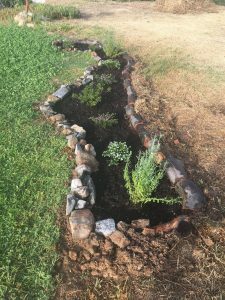 Teresa and I spent 5 days harvesting what we needed to be have our own oil at the lagar. 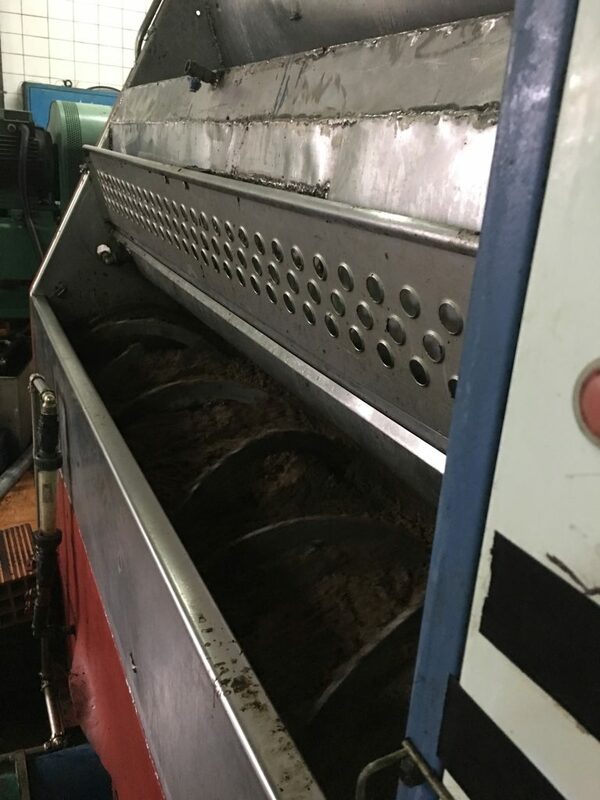 They set a minimum amount because the lagar processes in batches and a minimum batch is around 500kgs. It wasn’t hard work, but it was very tiring. 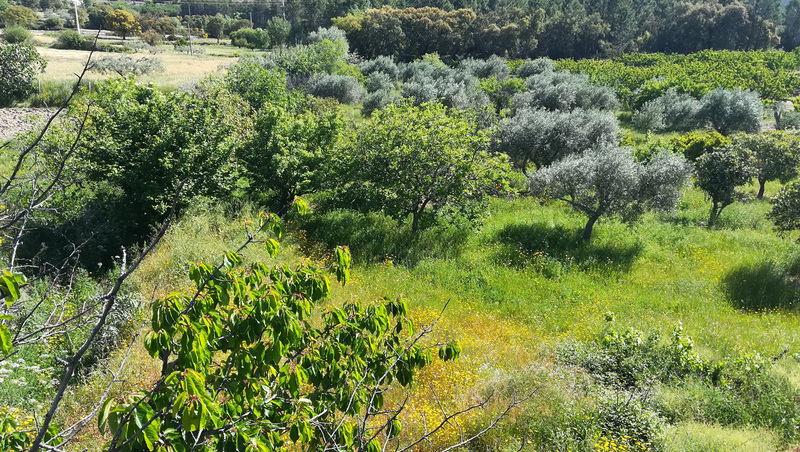 We would start about 9:30 in the morning ripping the olives from the trees, work up to about 1:00pm stop for some lunch, then carry on from around 2:00pm until 4:30ish, when it started to get dark. Most days we could harvest about the equivalent of 8 crates (we only had 6) but it was dependant on how rich each tree was. Some days we only did 6. After cleaning ourselves up and having dinner, we would sit and sort the twigs, leaves and any bad ones out, then bag them into 20kgs bags, just because that’s amount all I wanted to carry at any one time. The bathroom scales came into play here. On the Sunday we loaded the car, oops may have a bit more than the car should be carrying and made our way to the lagar, we made it OK. There a many lagars around, but we used the same one as our friends had used, for obvious reasons, plus they spoke English which helped. 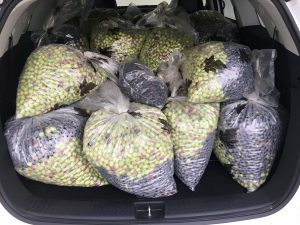 We actually collected 520kgs of Olives, which produced 77 litres of oil. 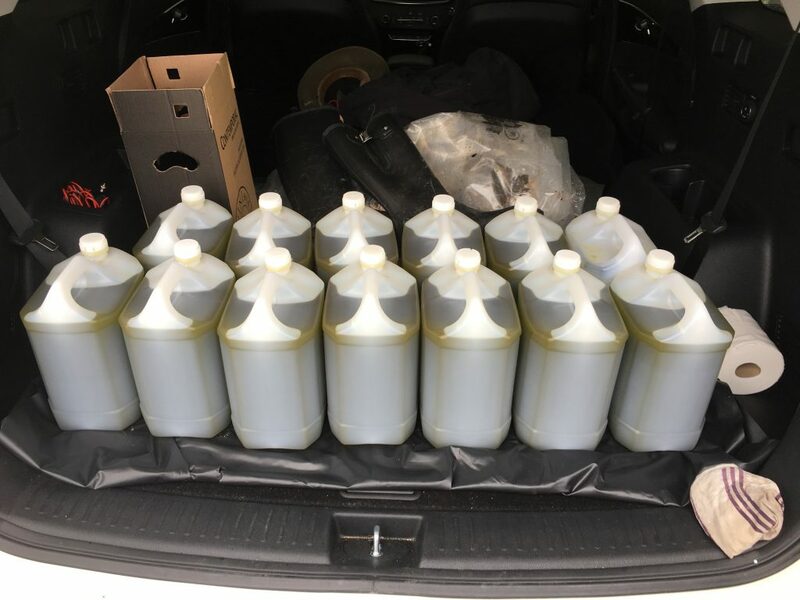 We paid for the processing in oil, this lagar charges 19%, so we drove away with 64 litres. We were over the moon, not bad for a first attempt. You can pay the lagar in cash for the oil if you want it all, but it just makes sense to us to pay in oil. 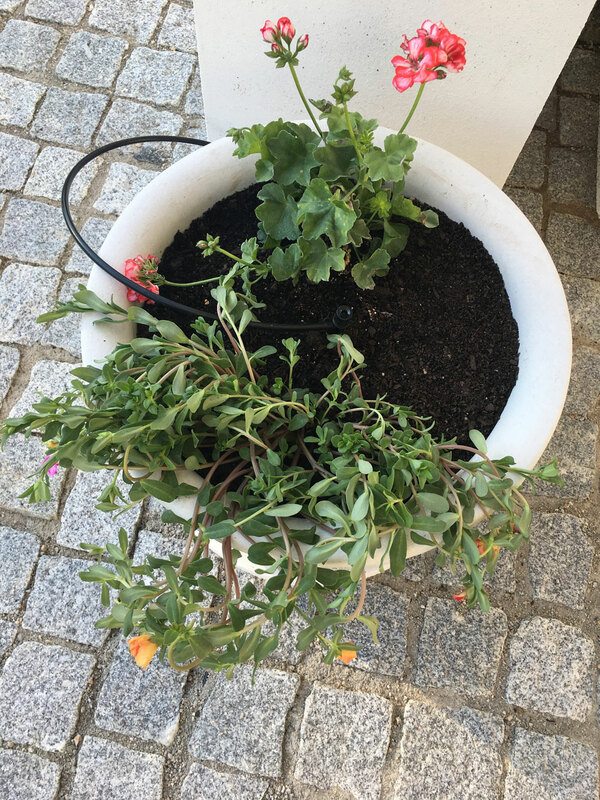 All we had to pay for was the containers to take the oil away in, cost was about 6 euros. 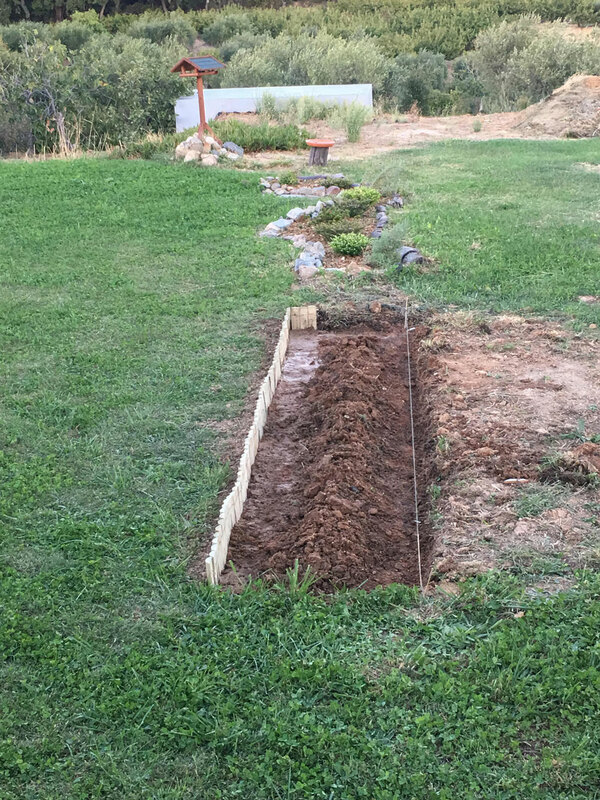 Since the house was built we have as expected had some ground setting. 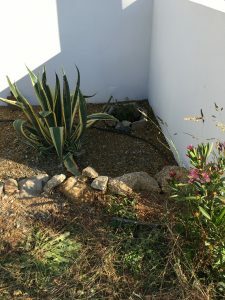 Whilst things in the house have been fine, the granite path around parts of the house, particularity where the waste pipes run, have sunk enough in areas to cause a possible trip hazard. 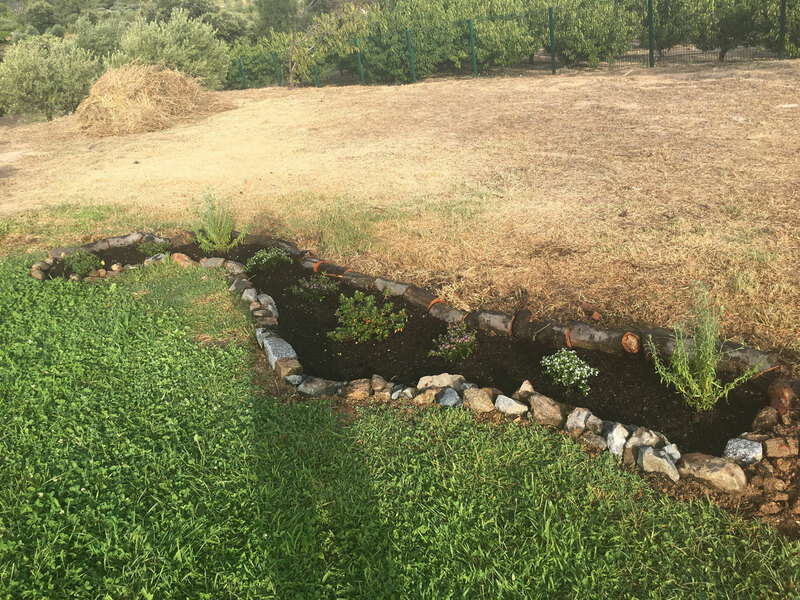 We felt we had to do something so we had the team that redid our entrance back to lift all the granite cubes in these areas and repack sand underneath and level everything up again. Only took a couple of days work but it looks so much better now and the trip hazard has gone. If you want to know more please email me at ian@casaneroli.com. 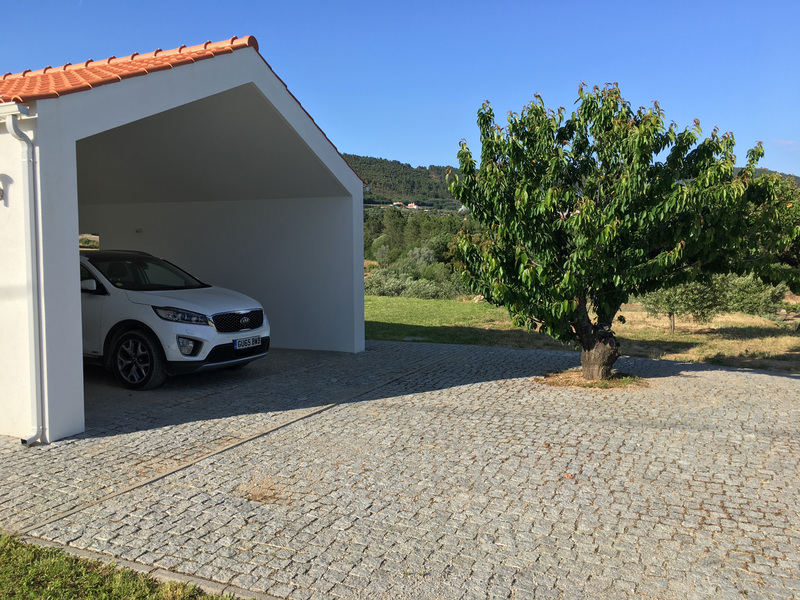 We have a small garage which came with the extra piece of land we brought. The building itself is well built, even if it is a bit rough. 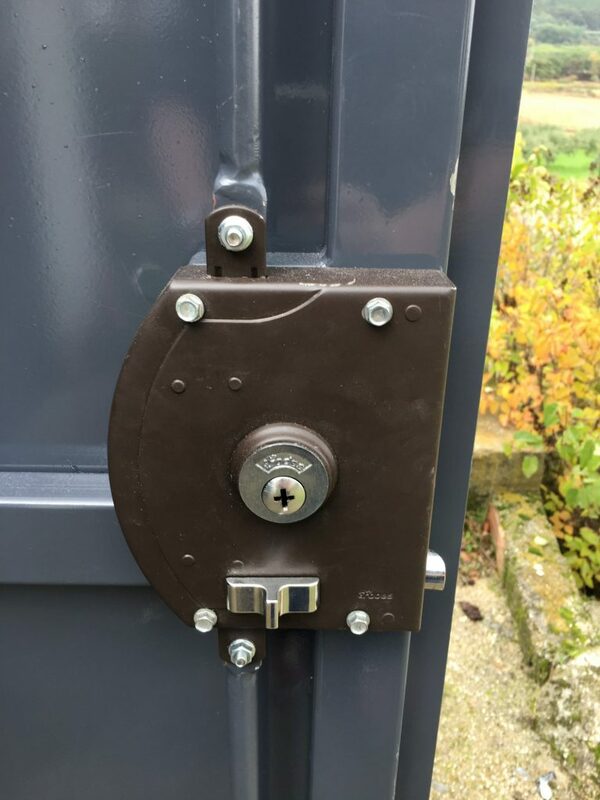 The only issue was the doors they badly needed replacing, several of the hinges were broken and it wasn’t very secure. The doors although in 4 sections and folding opened inwards, which was a bit restrictive. 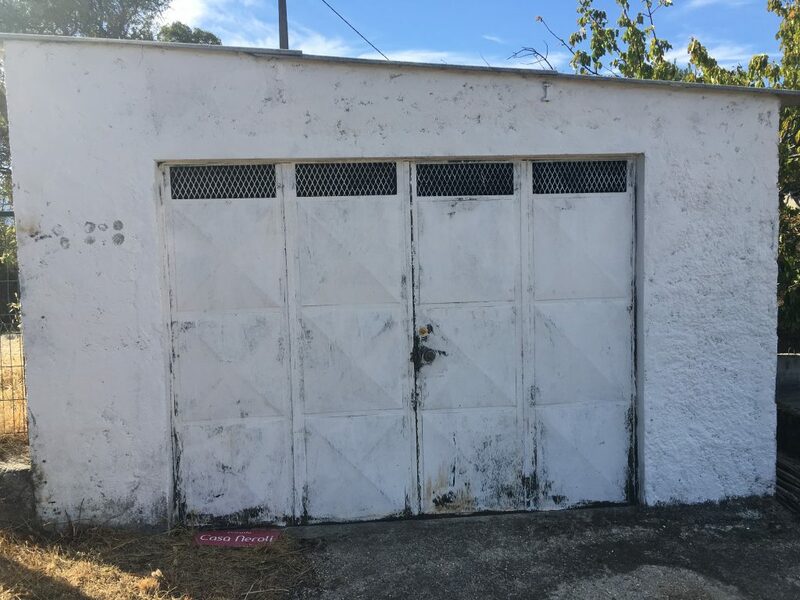 The previous owners had also poured concrete on the floor to make a solid base inside the garage but they didn’t allow for the doors so they never really opened properly. You can see the old verses the new doors in these photos. 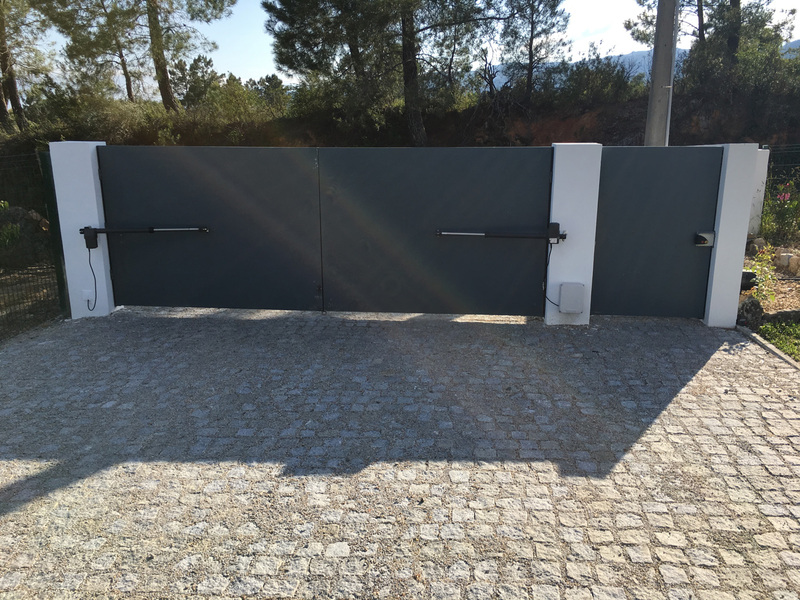 We spoke to Miguel Valente, the guy who make and fitted our main entrance gates. 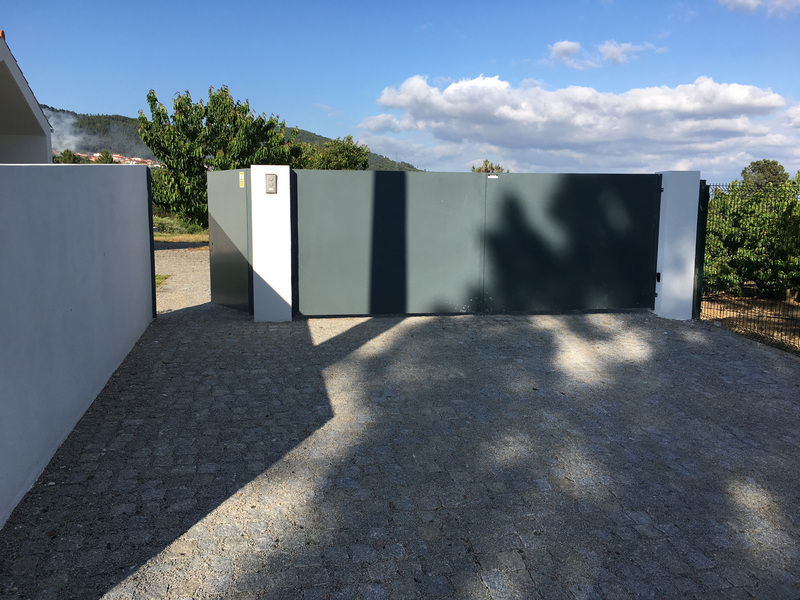 We agreed with him what was required and he made the doors and fitted them within 3 weeks! excellent service eh! 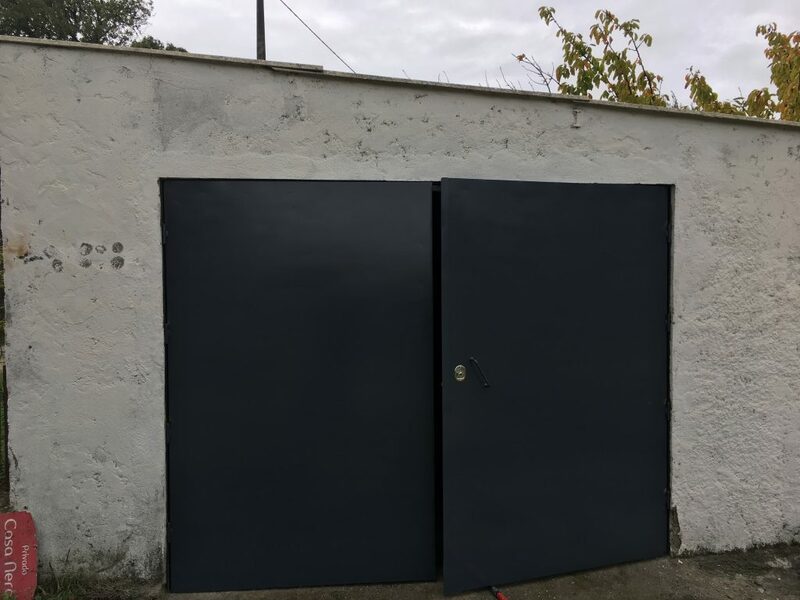 He did a brilliant job and I think the garage will fall down now before the doors give up, you can see from the photos here the result, including the size of the lock and bolts. 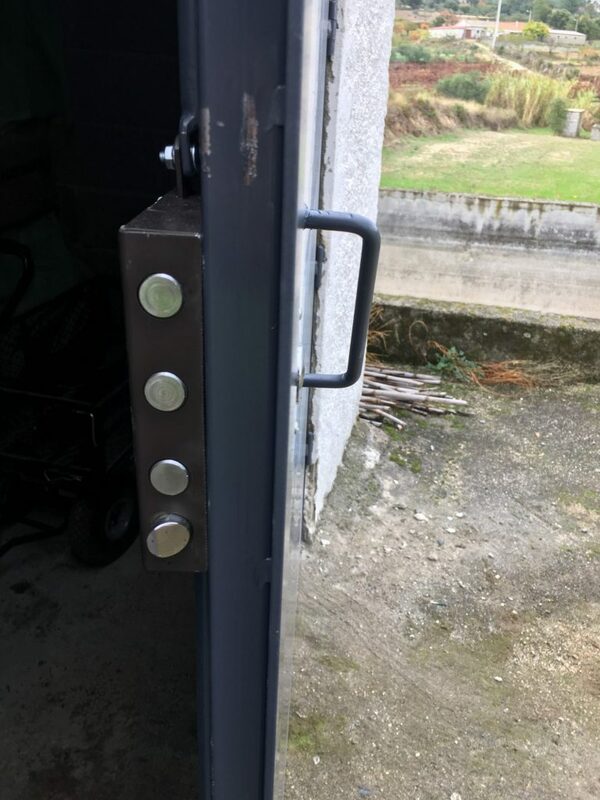 Its certainly a strong and secure job. I guess I will have to smarten the outside now and repaint. 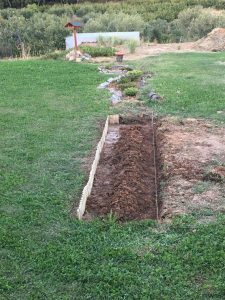 The next project we wanted to tackle was the section of land just the other side of the new flower borders. This was the site of the original brick hut that we had knocked down a while ago. 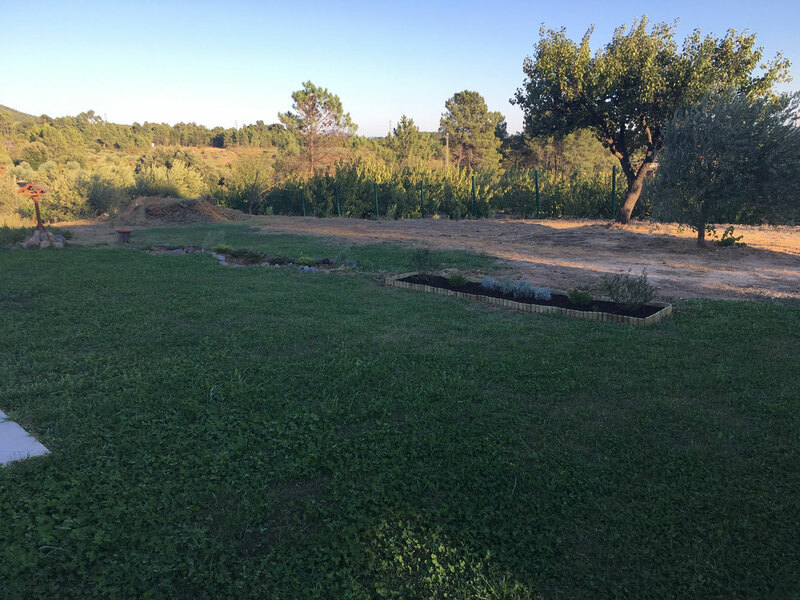 The area, furthest from the house we are using as a composting area. The rest of the area was very rough and just grew weeds, however over time the clover/grass from around the house has started to spread over this area and with the work we have done on the flower beds it seems to have naturally smoothed this area a fair amount, so much that I am able to run a lawnmower over the area. 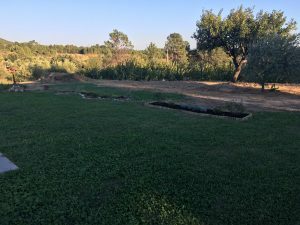 To encourage the clover/grass to spread and grow, we decided we should add some irrigation (water spray) to the area, and run tubing up the area enough to allow for us to add a raised vegetable bed at the top end near the house. 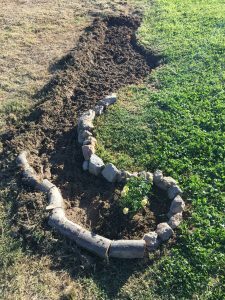 We have started to put in the tubing for the watering, there is still a way to go as we are learning how to make it all work, as we go. Here are some photos to show what we are taking about and shows how far we are at the moment. 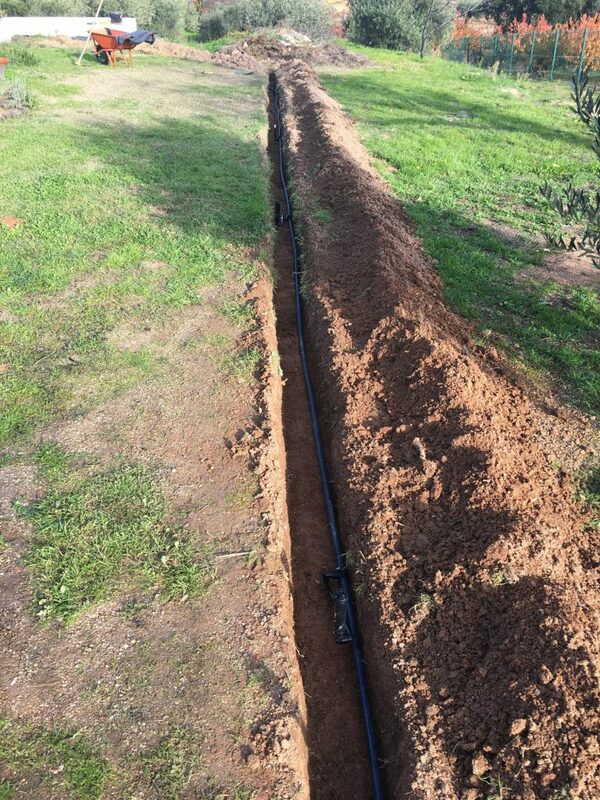 I know it seems a strange time of year to be installing watering as it is the wet season, but with the ground being wet, it is far easier to did the trenches to bury the tubes. In the summer the ground is so hard, it is impossible without a machine, so do it now then it will be ready for the spring, hopefully! We are having a few teething issues getting the sprinklers to work properly. I put 4 pop ups sprinklers on the tube but there doesn’t seem to be enough pressure to run all 4. I can run 2 perfectly, but not 4. I took the decision to lay a second tube so that if I can’t solve the issue we can run 2 on one and two on the other, albeit it be at slightly different times, but the controller allows for that. Maybe not the correct solution, but it should work. I still have to connect up the second run. 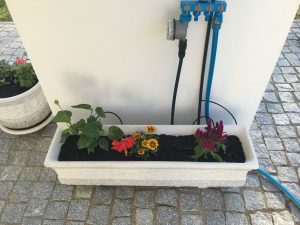 The parts are not expensive so it’s fine, and even if I do work out the issue I can use the second run to set up an alternate feed to the vegetable patch when completed. I suspect we will need a different watering regime for the vegetables and grass anyway. I will blog again when / if we resolve the issue. On one area of our land we had an old concrete water tank, which every year filled with rain water and was full of frogs and the detritus that comes with them. 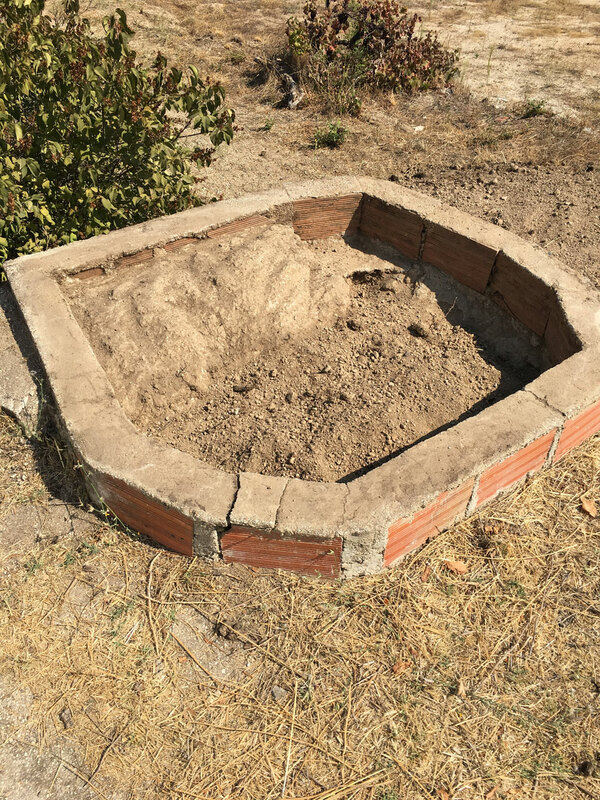 It was obviously used to push water up to, so it could be used to run down over the land to water any planting. 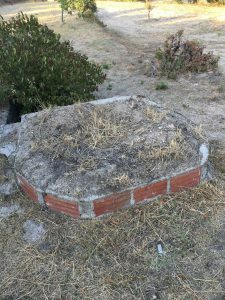 In the summer the water would evaporate and leave a slushy mess in the bottom of the concrete tank. 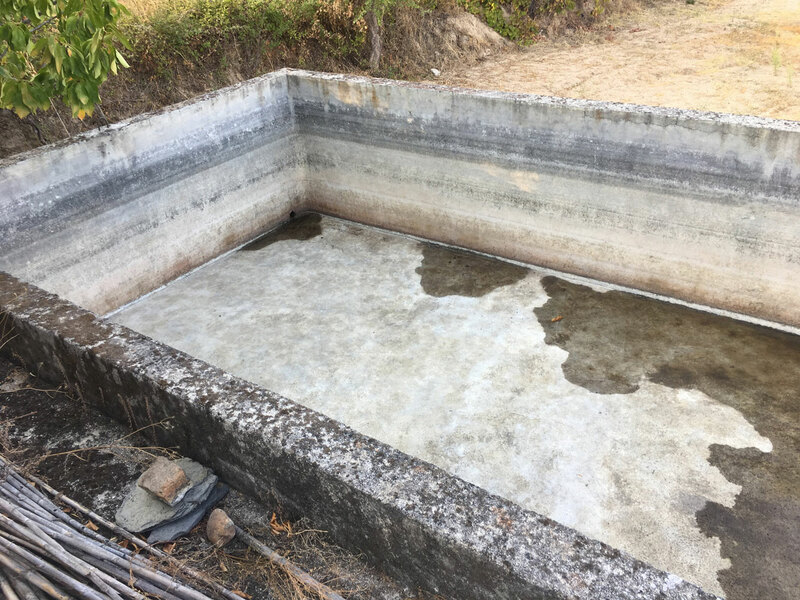 This summer was very dry and hot and all the water evaporated, the tank had dried out completely. This left a hard, crusty layer in the bottom of the tank. This was a suitable opportunity to sweep it up and clean it out. This led to me investigating a bit further to see how it had been used. I found a couple of holes in the sides of the tank which must do something. 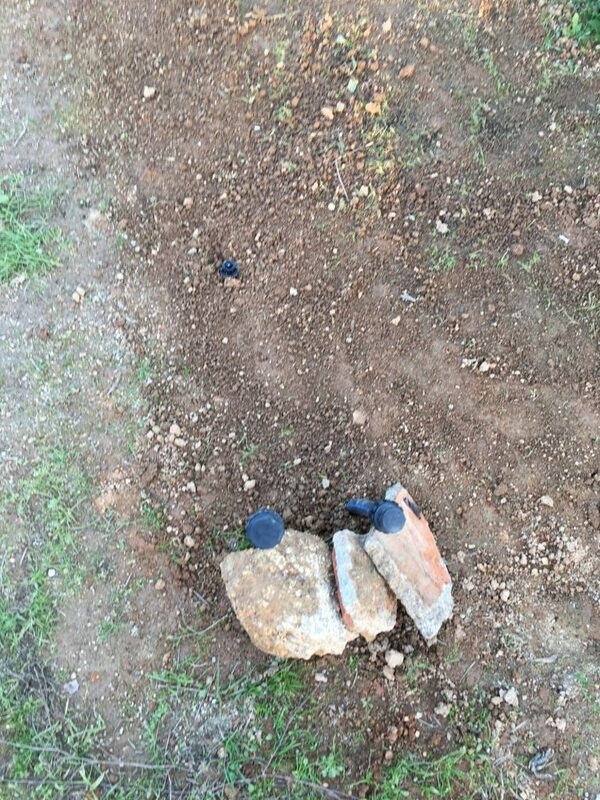 Digging down on the outside I found a bricked drain type area, in each drain was an old cast valve type thing on the outside of the tank. I gave them a good squirt of WD40 and much to my amazement they still worked. This gave me further encouragement to work out how it was all used. One valve just seemed to let the water flow across the top terrace of land, but the other seemed to have a further pipe at the bottom of the drain. This I found ran under the track and poked out in a wall on the other side of the track. 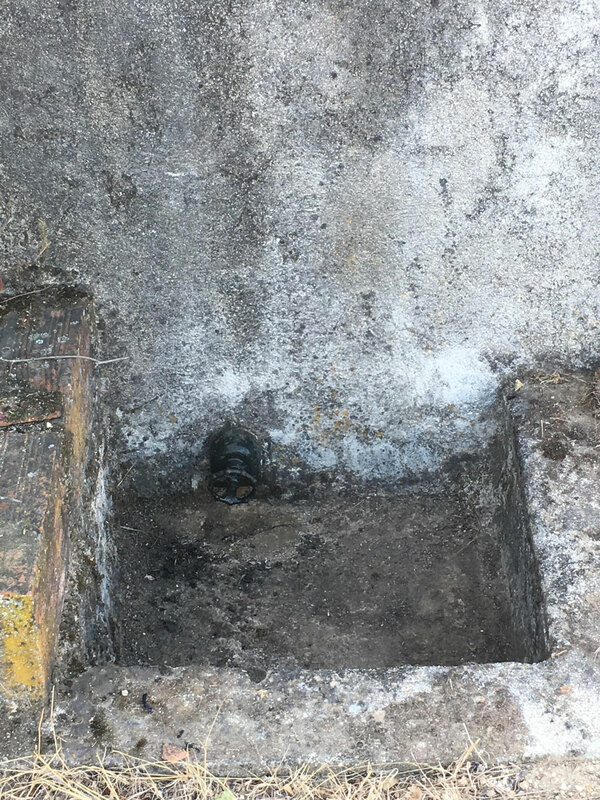 There underneath there was a further drain arrangement, with two pipes which released the water across the lower terrace of land. 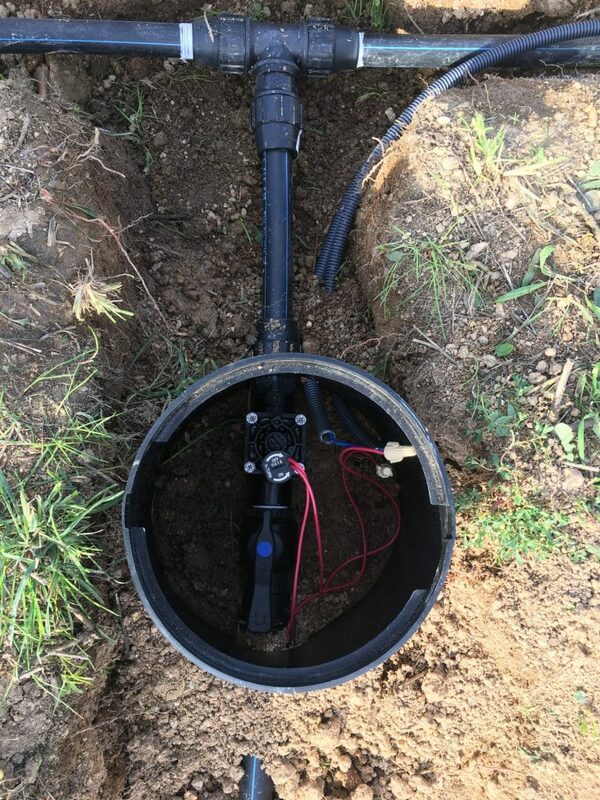 So, using the valve on the concrete tank, it was possible to release the water from the tank and it would work its way under the dirt track and water the land, clever. I cleaned everything out to see if it still operated and tested it using a hose from the house and much to my amazement it worked. 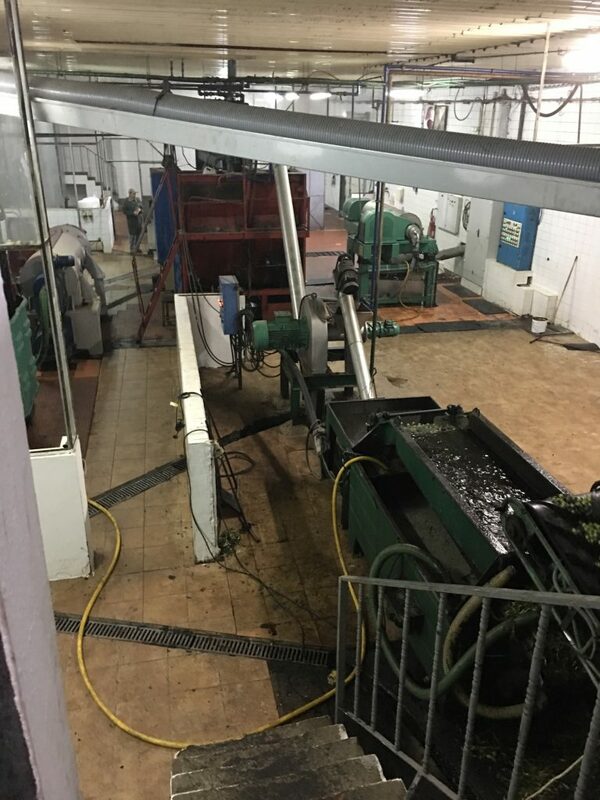 Now we just need to work out how they pumped the water up to the tank. 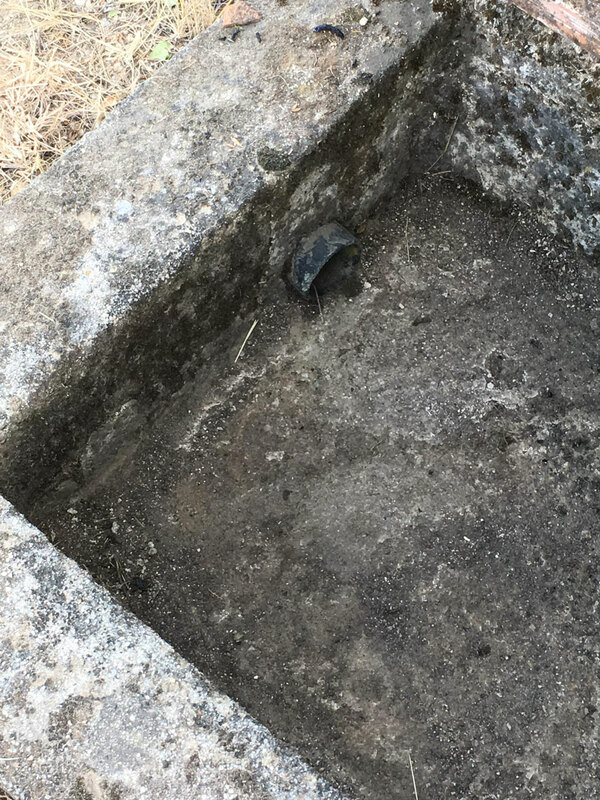 We have two wells on that part of the land and I have found a few bits of pipe in various places, so I suspect they had a pump somewhere to pump the water from a well into the tank. There was just one other area around the tank which needed investigation. There is a hexagonalish construction which has been filled in with dirt. We don’t have a clue what it was used for. It seems to have a brick rim, put on top of an old concrete construction. 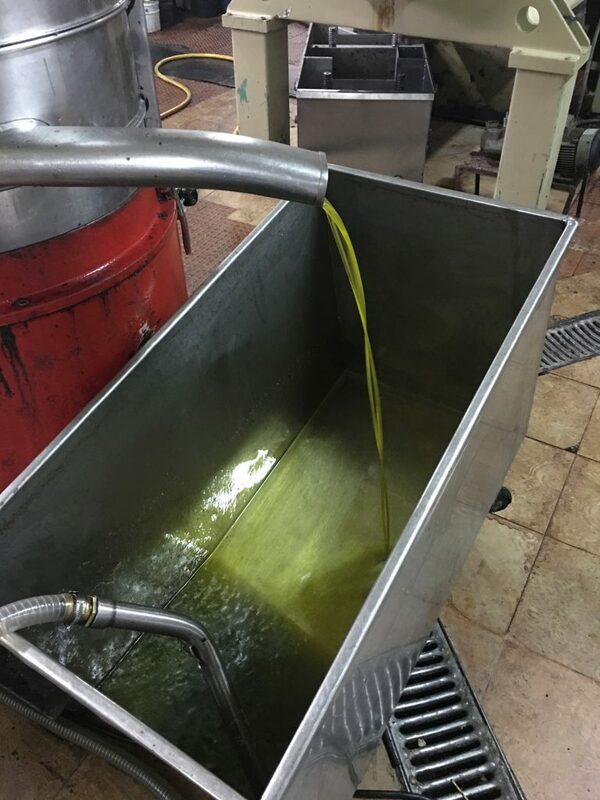 Thoughts are a platform for a pump, a filled in well, a olive wash, a tank for grape pressing. Further investigation is called for. 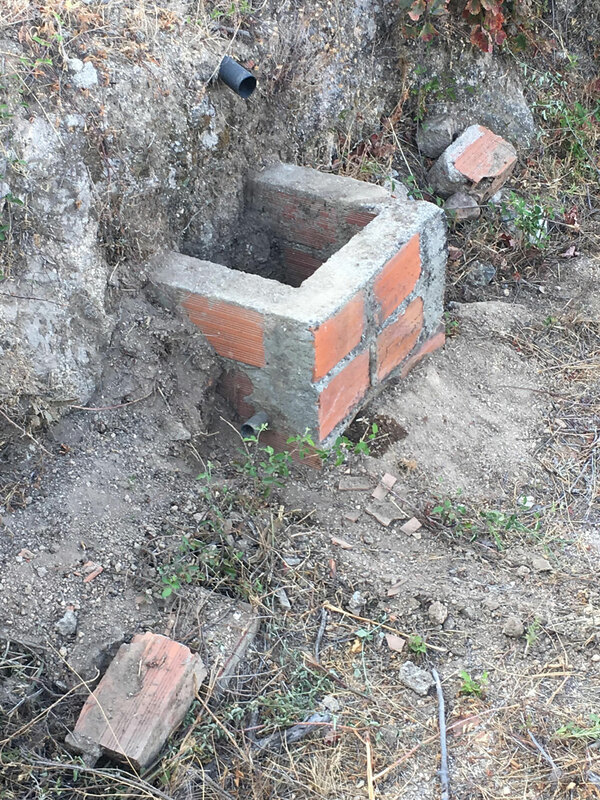 I have been gradually cleaning it out, the first thing seems there is an amount of waste concrete dumped in one side. I think this might have been the left over from when they put a new layer on the floor in the garage. Digging down it looks like there may have been a flat cement surface just at the bottom of the brick layer, the top of the concrete part. 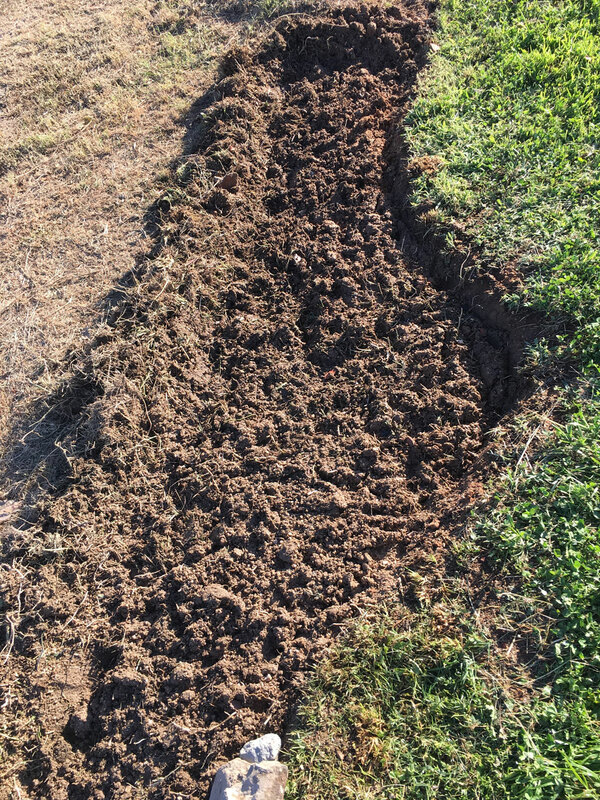 This is just around the edge, the middle had still more soil, digging further it seemed quite soft, the material dug out looked like old rotting tree waste. Progress was slow as it was very hot and the ground very hard, so I have left it for now until the rains come and it softens the material inside and I will dig a bit further. Come back in future and I will blog again as we uncover what it might be and what we decide to do with the area. The next area we wanted to attack, was the bit if land where the old hut used to be. 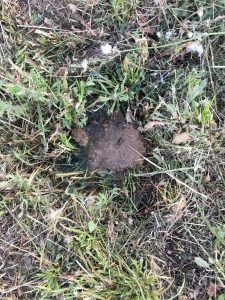 We had grassed up to the hut when it was there, but we now have this area of rough ground which is just weeds, now the hut has been demolished. 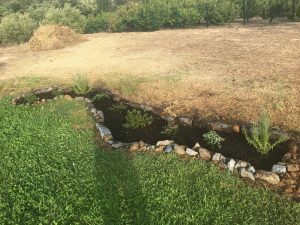 There was a, kind of line at the edge if the grass, which had a shallow dip, this seemed a natural break / edge to form some kind of floral border. 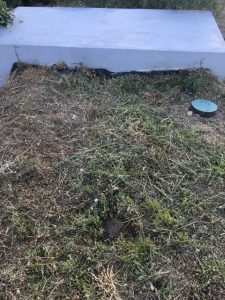 There were already water sprinklers that covered the grass, on inspection I could see that I could see that I could adjust them to cover a 360 degrees spray, rather than the 180 degrees they where currently set to. 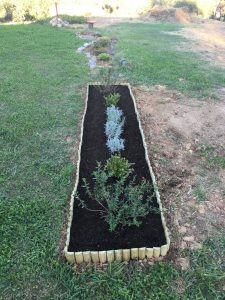 This would mean any flower beds could be covered as well. We decided to tackle in two stages, just to check everything was ok, before we invested in too many plants. Here are some photos showing the progression over the two stages, in this area. 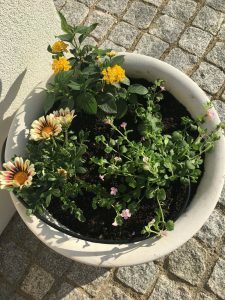 Hopefully you will agree that the result, although still a little raw, will form a basis for a nice area when things get established. 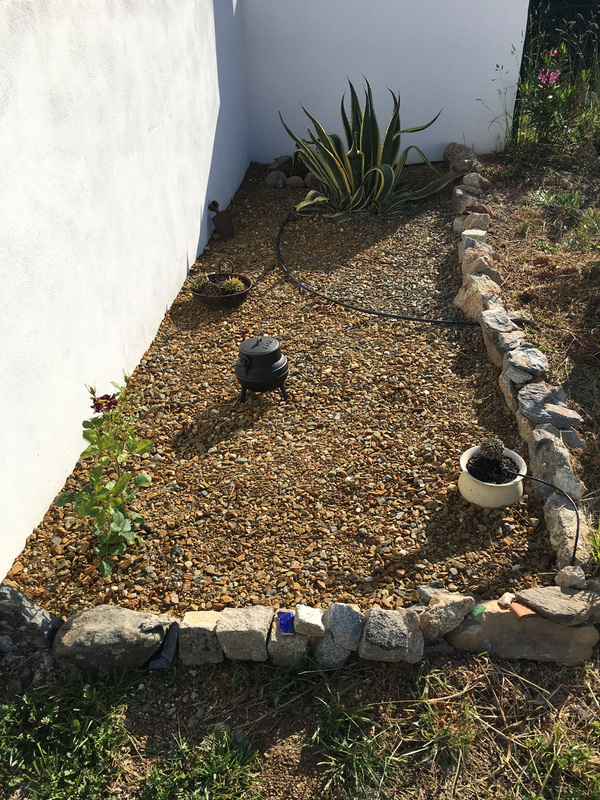 One by product of this job was, that with the opening up of the water sprinklers to 360 degrees was that grass also started to grow on the other side of the new borders, so it looks like it will tidy that area a bit as well. I have already started to mow it. 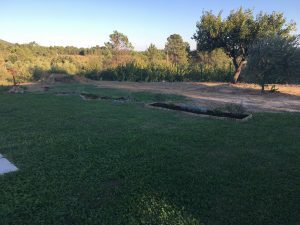 The idea is that eventually we will try to grow a few vegetables in the area the other side of the new borders. 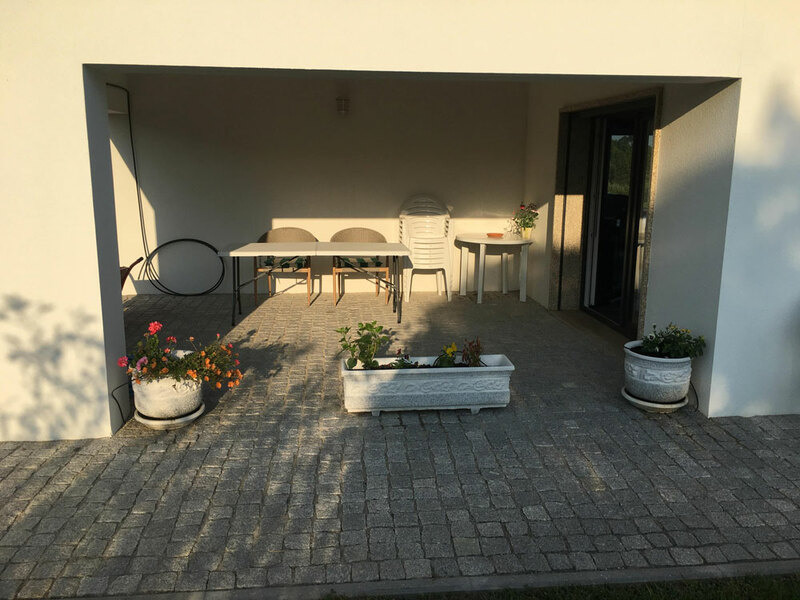 We felt as we are both retired now and spending a lot more time here, we need to make the place a bit homelier. We felt getting a few more flowers/plants around the place would help. 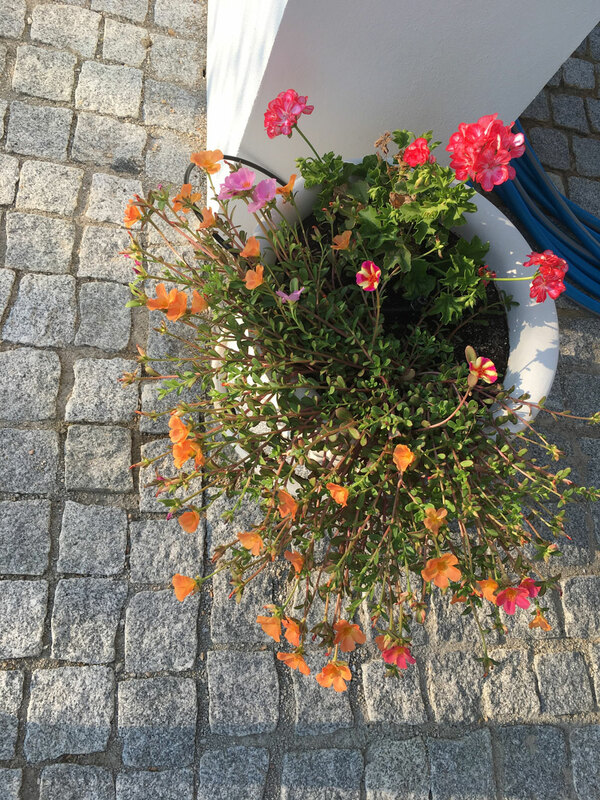 We have a lovely covered outside area on the corner of the house, we felt that some nice pots would look good. 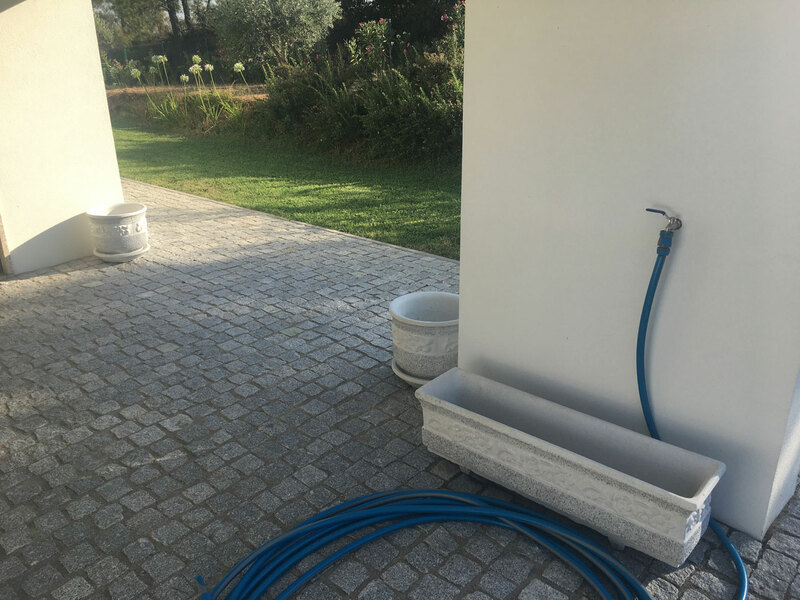 The first job was to make sure we could get water to the area, so we could set up some automatic watering system for when we are away. The builder had the foresight to put a water outlet in the area, it just needed a tap adding, so first job is to remove the cap and replace with a tap. Next add some nice pots, add a watering system and finally plant. 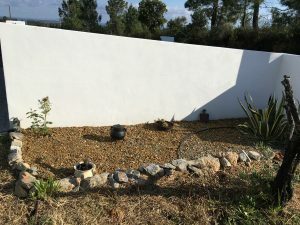 Here are some photos showing the progression. Things still look a little clinical, but we have the basic bits in place and we are sure it will evolve more as time goes on. 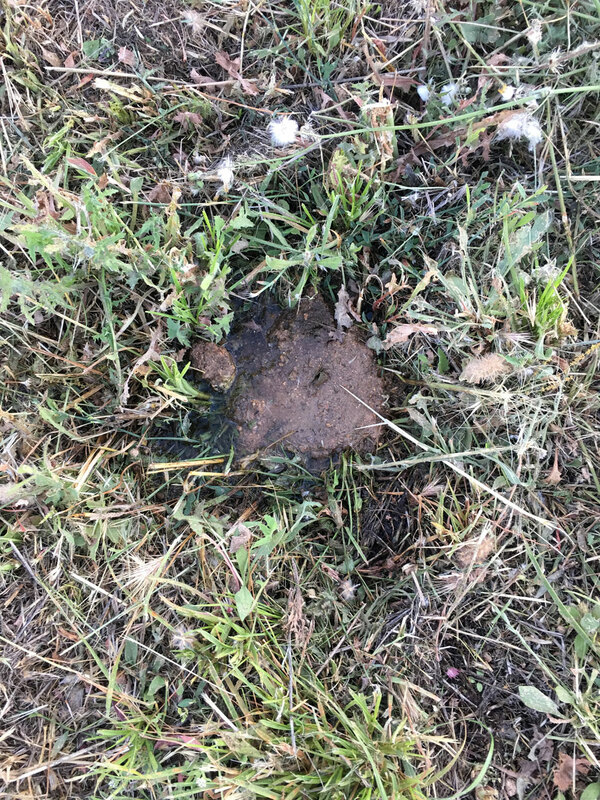 Walking around the farm, I came across a wet patch about 200mm in diameter, all around the area was very dry so obviously something was amiss. I was very quick to blame some workman that had been clearing the land for us back in February. I know roughly where all the water pipes run and I assumed they had damaged the pipes whilst turning the ground over. There are three groups of pipes around that area. 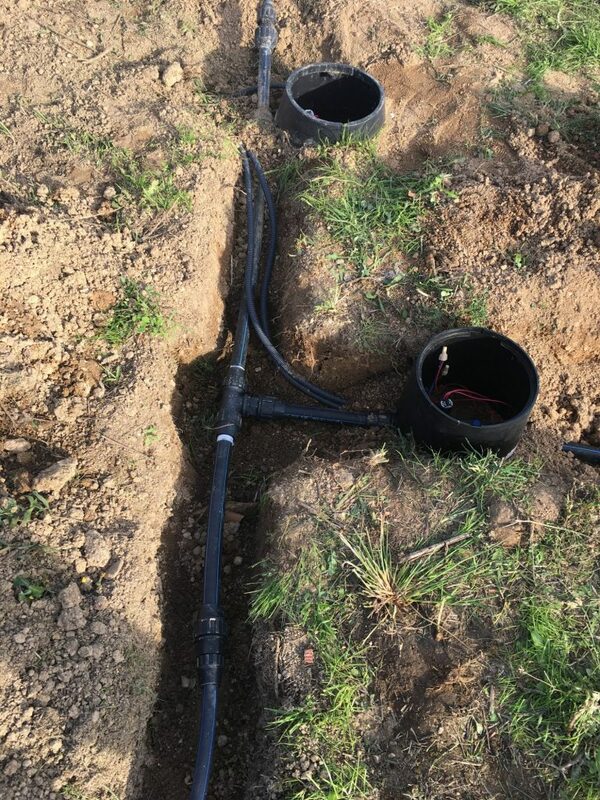 One is the main feed to the house, a second is the feed/circulation for the swimming pool and the third is for the irrigation. I was concerned if I open up the ground would I have an uncontrollable gush and spurting water everywhere. At least at the moment the dirt was holding everything in place. 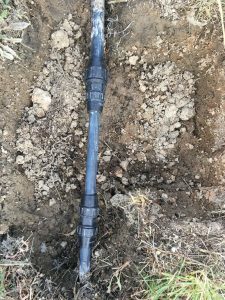 After a visit to a couple of local hardware stores and the purchase of a couple of variations of pipe joining connectors that I thought would help, it was time to dig down and find out what was going on. 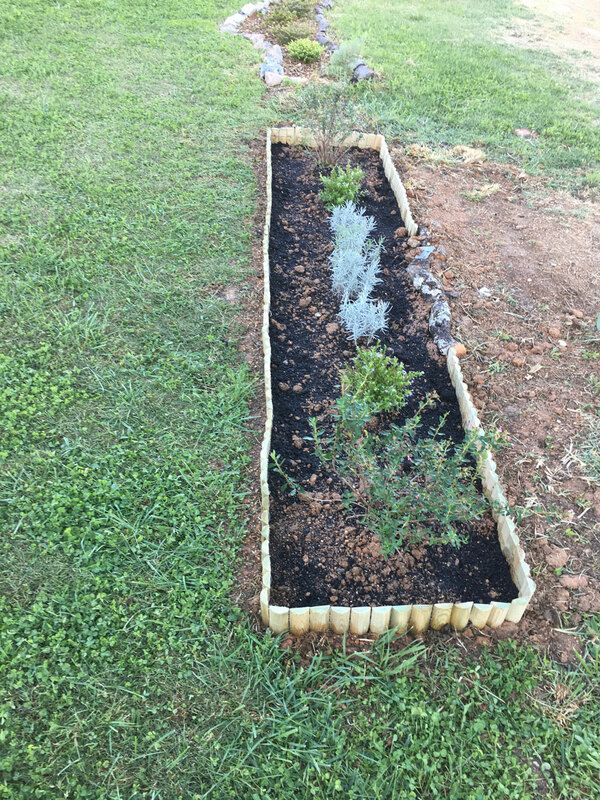 So, treating it like an archaeological dig, using a small garden trowel, I scraped away at the soil. 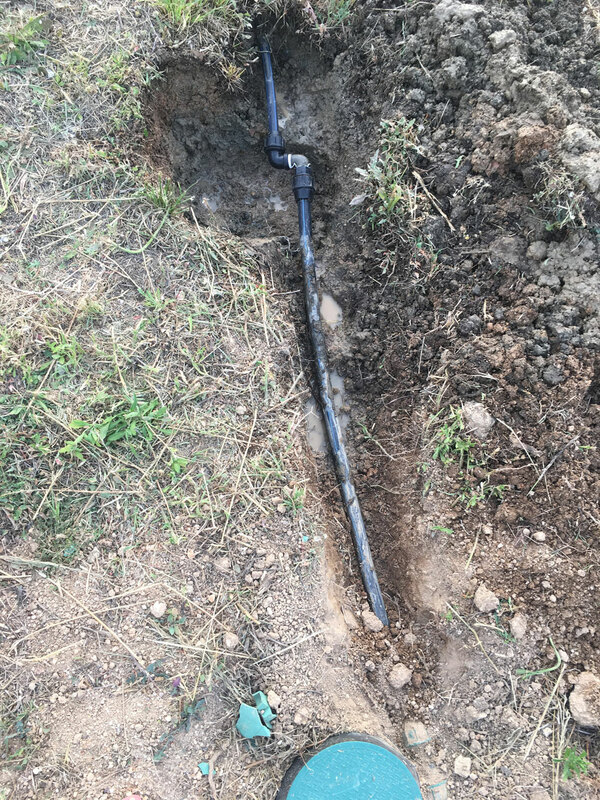 Eventually, I found the problem, it was, fortunately just a bad joint on the irrigation pipes. 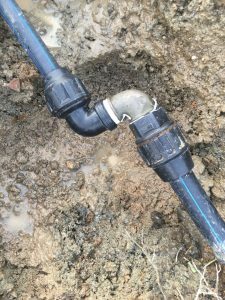 I had seen this issue a couple of years earlier and had reported it to the engineer that fitted the irrigation system and had believed it had been fixed. Obviously, only a bodge job had been done and it had just been covered over. 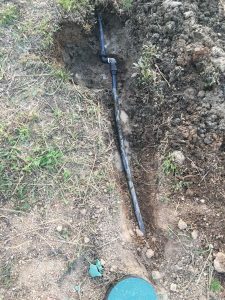 It was a relief that it was not on the main water feed to the house and I could just turn the irrigation system off to make a repair. Of course, none of the connectors I had brought were of the right type, so a second visit to the shops was required. 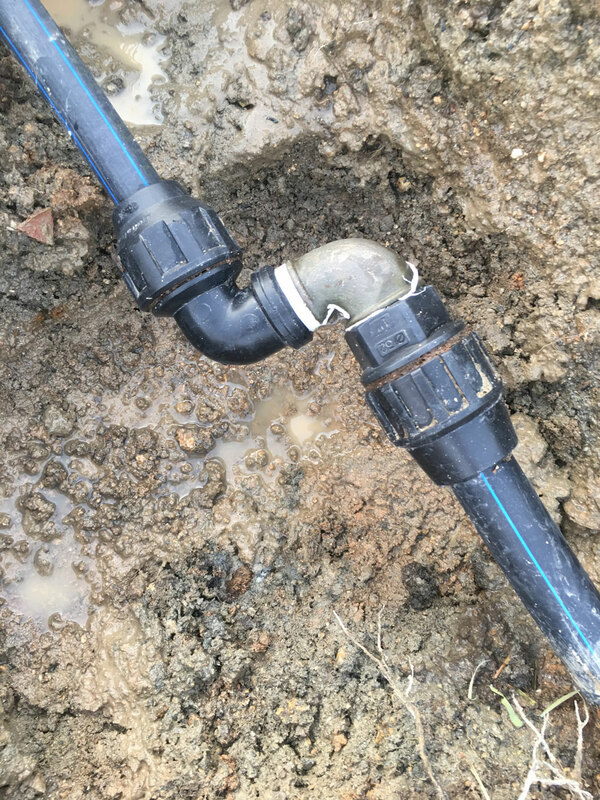 Once the correct fittings had been obtained it was a simple job to cut out the bad connection and made it good. 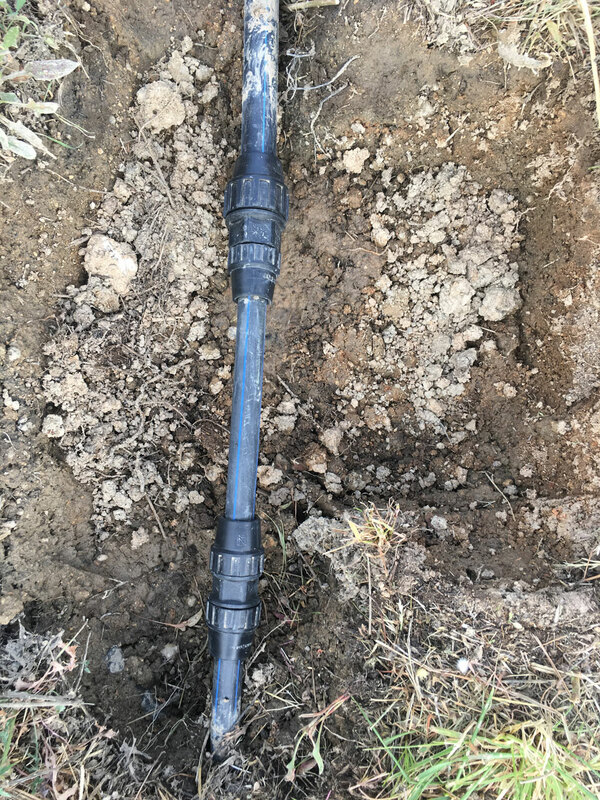 A quick test of the irrigation system proved nothing leaked and I just left it for 24 hours to double check before reburying the pipes. 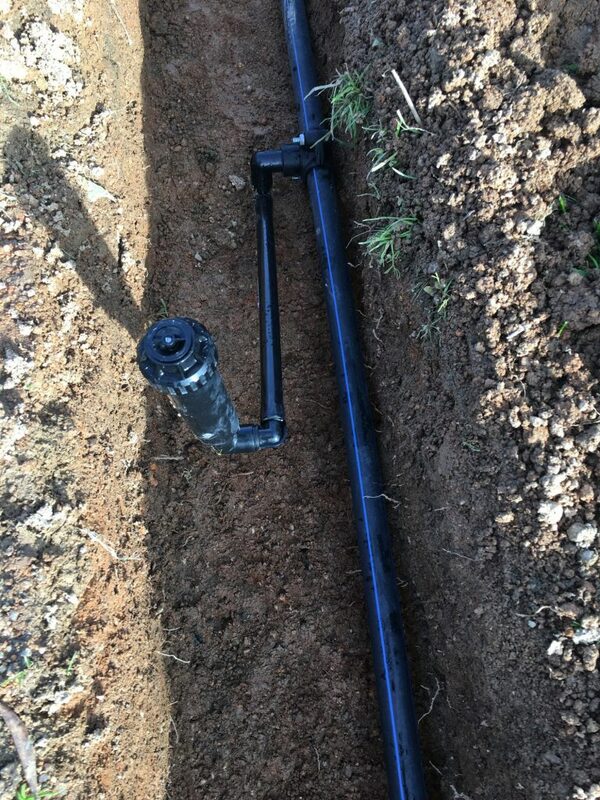 I had also worked out how all the irrigation system was connected, both water pipe wise and control valve wise, so now have the knowledge to be able to extend the system in the future is required. So, news from Casa Neroli for the last couple of months. 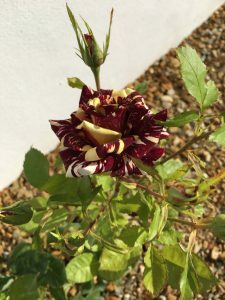 The weather during May and June was awful, very wet and miserable, usually the sort or weather expected in January and February, but like the rest if the world the weather seems to be a little off cycle this year. 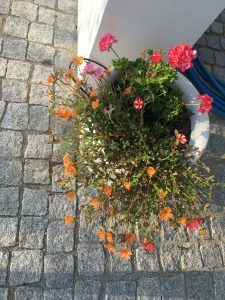 However, the good weather seems to be back now, long may it stay, although we don’t want to see the fires that we saw last year in Portugal. The entrance drive and gate as reported before is all complete now and the new arm has been installed, it is working a lot better now, we can pull in off the main track and any visitors can do the same before we open the gate. The steep slope has gone and the swing in is wider now, just makes everything so much easier. 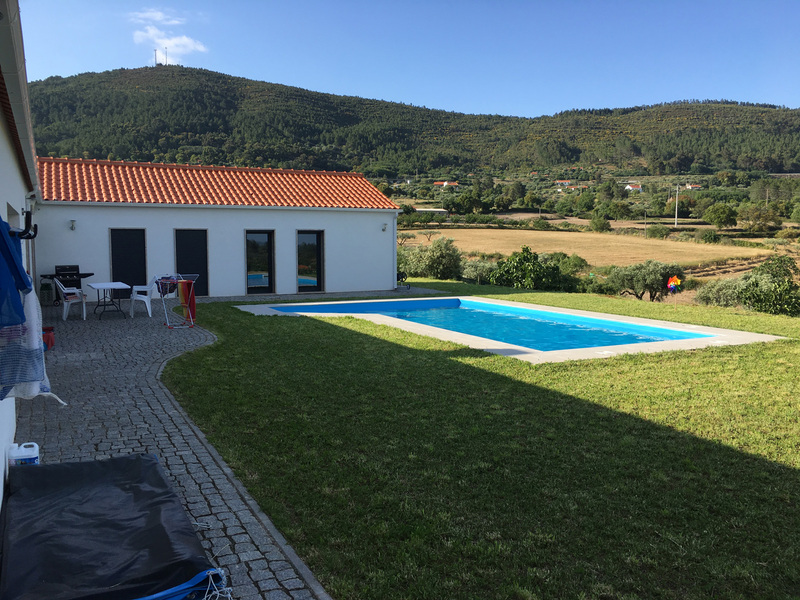 The heating on the swimming pool, works well, although it is quite expensive to run. It does however make the pool so much more enjoyable, 28 degrees is perfect! Any way the heat pump only cuts in when it needs to, so when the sun is out the pump runs less. We did need to get the electricity supply to the house increased as when we tried to use the oven, with the heat pump running the power tripped out. This was a relatively easy thing to do, just a visit to the local EDP office and two days later it was all sorted. The farm and the land around the house has been cleaned, although we are still having a couple of issues with the damage the contractor did to the land. 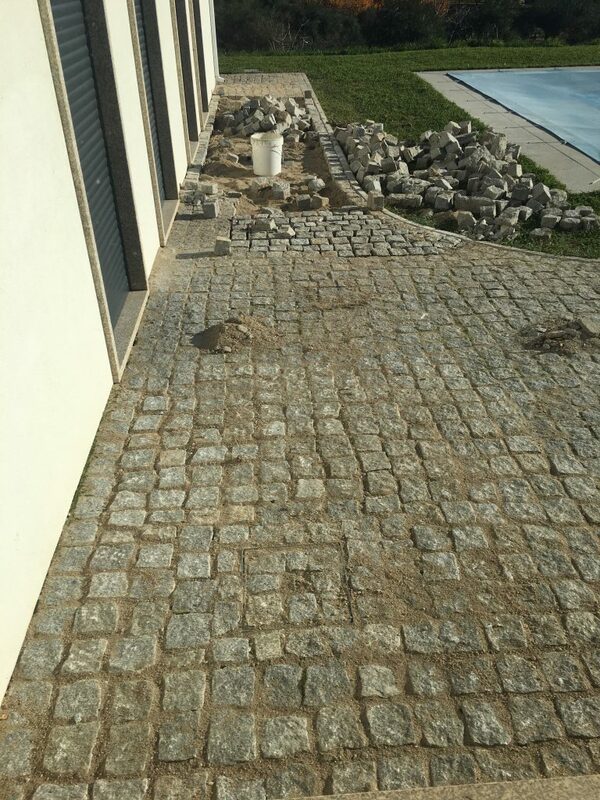 I don’t think the sub-contractors that Mr Proenca used this time, cared as much about the job they did. 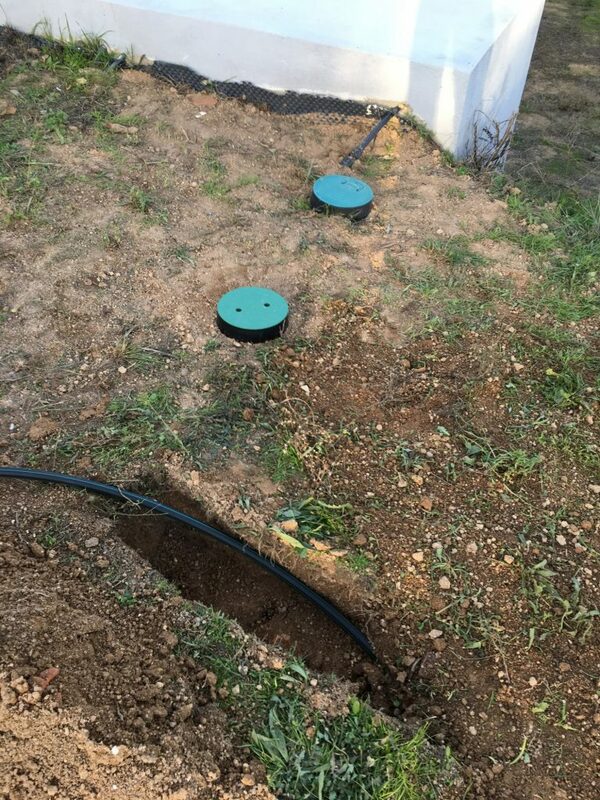 I was able to repair some of the things, like putting the cover back on the septic tank and repairing the irrigation pipes, although I shouldn’t have to. There is still the fence repair to be done, where they obviously damaged it with the tractor, but he has had the valve and cover repaired, again damaged by the tractor. I am sure we will get this sorted soon. Then I guess I will have to pay him! We have re-structured the cactus garden now the entrance has been completed, everything is the other way around now. 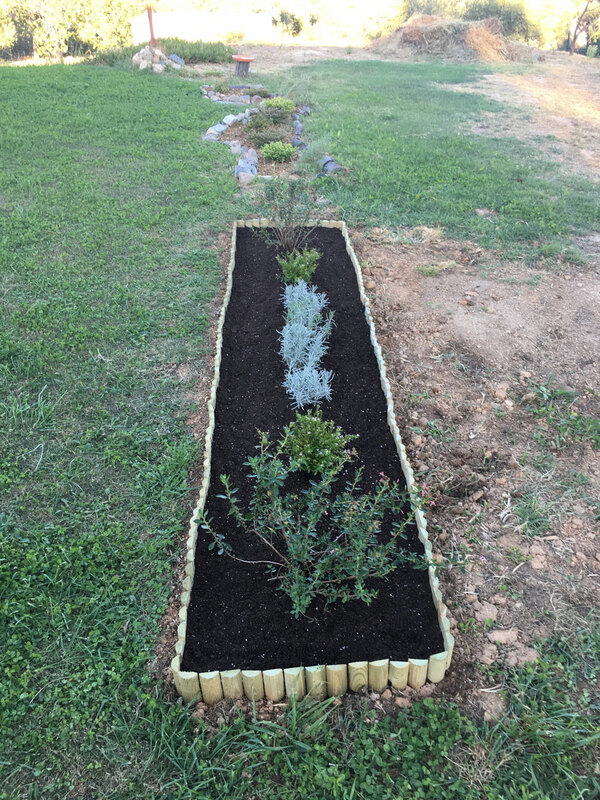 It didn’t take too long, just needed to clear the weeds, add a bit of gravel, a few “ornaments” and start adding a few plants. This time we added a really pretty rose and a Bougainvillea, hopefully they will survive and grow up the wall a bit. We have also found a guy, Tiago, who comes every couple of weeks to cut the grass around the house. He is very reliable and reasonably priced. 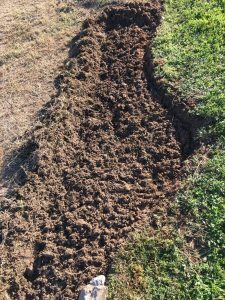 Regularly cutting it is better for the grass, it stays greener longer as the watering gets to it better and it is easier to cut when he comes. So all in all, pretty good. Long may it last!